The 4th edition of the classic Milan-San Remo started in a cold rain. Sixty-five riders left the start line on Pedesimo Piazzale in Milan and raced into severe weather conditions. The climb of the Passo di Turchino at this time of year normally provided less than optimal road conditions. This year the surviving riders rode over the Turchino through a very strong wind and 20 cm (8 inches) of snow. Frenchman Eugene Christophe used his cyclocross training to ride, walk, and run to survive the horrendous climb. As he rode across the flatlands toward the Mediterranean coast the snow abated but the temperatures plummeted. Frozen and delirious Christophe staggered into a local Inn. After 25 minutes Christophe saw several riders pass the Inn. With feeling back in his body Christophe remounted to continue the race. As the finish line in San Remo approached the thought of winning the classic Milan-San Remo gave Christophe renewed energy. 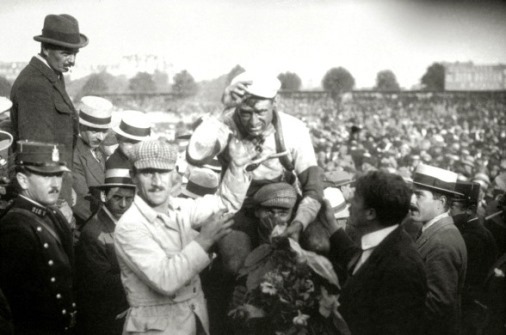 At 6pm, 12 hours and 24 minutes after starting in Milan, Eugene Christophe crossed the finish line over an hour ahead of second placed Italian Giovanni Cocchi. SPECIAL NOTE: Of the 65 at the start only 4 finished the race. Christophe was taken directly to the hospital, where he stayed for nearly a month. He did return to racing but struggled for 2 years to regain full strength. SPECIAL NOTE: Defending champion Luigi Ganna crossed the finish line in second place, but was the first rider to be disqualified at M-SR. The Italian was disqualified after it was discovered that he had covered part of the race in a car. 1. Eugene CHRISTOPHE (Fra) 12h24'00"
2. Giovanni Cocchi (Ita) +1h01'00"
3. Giovanni Marchese (Ita) +1h17'00"